Electro-optic modulators (EOMs) are an easy to use and efficient tool to externally modify the phase, frequency, polarization or amplitude of a free-space laser. In contrast to acousto-optic modulators the spatial mode of the laser beam remains unaltered. 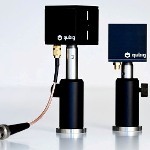 So EOMs are an ideal choice when several frequency components are required in the laser spectrum. For instance in repumper frequency generation in laser cooling and quantum optics, spectral broadening to minimize stimulated Brillouin scattering (SBS) in high power fibers, and for frequency modulation (FM) techniques, like FM Spectroscopy, Modulation Transfer Spectroscopy or Pound-Drever Hall (PDH) Laser Frequency Stabilization. The modulation spectrum of Qubig’s electro-optic modulators ranges from DC-coupled phase shifters to high-Q, resonant EOMs in the MHz to GHz. 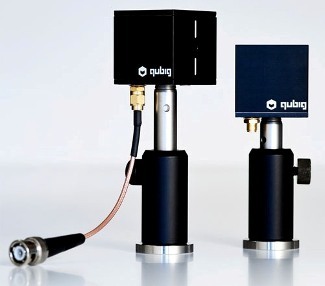 Qubig offers a GHz electro-optic modulator that has a custom resonance frequency (f0) from 1GHz up to < 4GHz with a usable bandwidth ~ 1% of f0. The EOM features a large aperture for easy alignment and is optimized for free-space lasers. It is available with a number of options such as temperature control, tunable resonance frequency, fiber coupling, double resonance, and Brewster angles.